BEND, OR -- Oregon Housing and Community Services has a five-year plan to create affordable housing across the state. Bend's newest City Councilor, Chris Piper, attended a meeting Thursday to learn about the new plan. He believes its focus on data, research, and customer service will help address this region's pressing need for housing, "This is something that is very top-of-mind with me, and I know, with a lot of residents in Bend, because we're at a place right now where housing production has really failed to keep up with population growth, and to maintain balance between supply and demand." Experts estimate more than 150,000 additional houses were needed in Oregon between 2000 and 2015 than were actually built, leading to the massive statewide shortage. Piper says he recognizes this isn't just a Bend problem, "It's important for us to look at this and say, 'Hey. it's not a Deschutes County issue.' We have to look at this as also a tri-County Issue. Deschutes, Jefferson, and Crook because there's so many differences between the counties, and so we have to work together." The five-part, five-year plan is in the early stages but Piper tells KBND News is should help more people achieve home-ownership, "Paving a way that's going to create greater ease of process for those in an economic class that we have to be mindful of, so we can ensure that they have a smoother way into a home, not making it more difficult." The plan will determine what kinds of affordable housing projects will work best for Oregonians, and Piper says he looks forward to applying its concepts to proposed projects in the region, with an emphasis on racial and social justice, homelessness or housing insecurity, and increased access in rural communities. 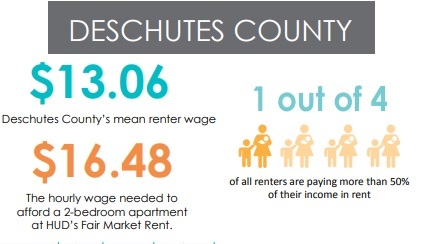 Graphic courtesy Oregon Housing and Community Services. Full report found HERE.